The Peoples Food Co-Op and Café Verde in Kerrytown of Ann Arbor are perfect for your organic and natural grocery needs. The café has great seating and a menu ranging from smoothies, juices, teas, coffee, other specialty drinks, soups and sandwiches. The grocery store, with separate entrance, has fresh produce, whole grains, natural beauty products, plus vegetarian and gluten-free frozen dishes! Check out their website to become a member and get member discounts! Also, be sure to stop by for one of their local favorite, the Hot Bar & Salad Bar. Click here for hours & location. Un-stress at the Crazy Wisdom Tea Room! If you’re interested in holistic health, bodymind therapies, yoga and astrology, than Crazy Wisdom might be just what you’re looking for! Located right downtown is Crazy Wisdom Tea Room, specializing in alternative spiritual practices. It also offers various items surrounding psychology, Buddhism, spiritual developments, zen/yoga, meditation, astrology, and herbal remedies. Shop on the main floor for art, music, book, crafts, candles/incense, yoga supplies, and ritual items, then head upstairs to un-stress in the café with a variety of teas, coffees, specialty drinks, and café foods to choose from, while you read a book from the upstairs library. Don’t forget to check the website for events and newly received books and CD’s! Take part in events such as tarot & psychic readings, shiatsu healing sessions, live music, meditation meetings, drum circles, and various workshops. Check HERE for the Crazy Wisdom events calendar. Head out this weekend and brave the bitter Ann Arbor air for the Winter Warriors Weekend. On Main Street downtown Ann Arbor this Saturday, Feb. 6th, is the first annual Winter Warriors Weekend event. Restaurants and cafes will have their patio furniture out for the bravest of the brave to sit and enjoy discounted beer, coffee, and teas. Check HERE for more details and discover all the wintery deals! One of the participants is The Jolly Pumpkin, pictured above. Located on University of Michigan’s Central Campus, The Michigan Union provides a ticket office, bookstore, campus information center, banking, food, study space and much more. A timeless resource for students and the University community! 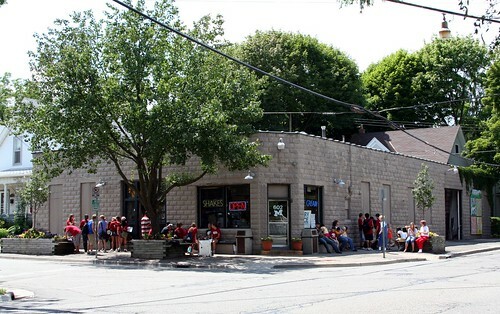 Located right around the corner from our Ann Arbor Real Estate office, in downtown Ann Arbor, is a local favorite – Washtenaw Dairy. In business for over 75 years, Washtenaw Dairy serves up over 30 varieties of ice cream and offers coffee, home-made donuts (the best I’ve ever tasted! ), and various dairy products. They also deliver milk, cheese, cream, and dry ice to local businesses. At any time of the day, you will find groups of people sitting outside of the store enjoying a cone and having a good time. Established in 1997 Cafe Felix, located at 204 S. Main in downtown Ann Arbor, is a wonderful European flavored coffee house that now also serves cocktails and is known for their great martinis. 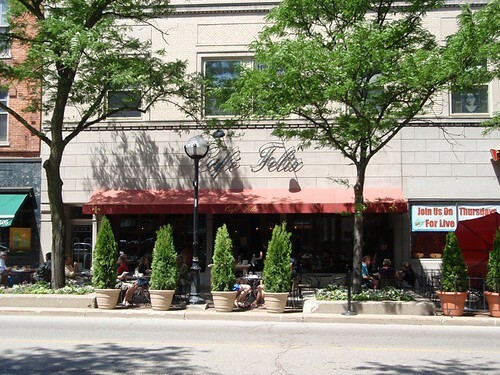 Cafe Felix has a great outdoor seating area that is perfect for enjoying a summer evening with friends.